Ground Rods copper plating over stiff steel core makes driving easy. 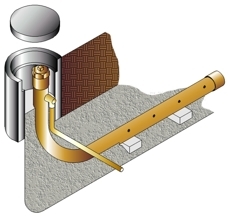 National Lightning Protection will custom design a grounding system to meet your requirements. C-Rods are identified first with a C (which stands for Chemically Charged), then by the length, then the shape followed by the type of conductor. For example, a typical ten foot straight rod with a 4/0 pigtail is notated C-10-S-4/0. Likewise, a ten foot L-shaped C-Rod with a 4/0 flat braid is notated C-10-L-4/0 flat braid. C-Rods are available eight feet and longer, either straight or L-shaped with a standard 4/0 conductor or braid and/or flat strap. All rods are shipped with inspection wells and adequate Bentonite for installation. Please contact NLP for more information..
National Lightning Protection will custom design a grounding system to meet your requirements. C-Rods are identified first with a C (which stands for Chemically Charged), then by the length, then the shape followed by the type of conductor. For example, a typical ten foot L-Shaped rod with a 4/0 pigtail is notated C-10L-4/0. Likewise, a ten foot L-shaped C-Rod with a 4/0 flat braid is notated C-10L-4/0 flat braid. C-Rods are available eight feet and longer, either straight or L-shaped with a standard 18" conductor . All rods are shipped with inspection wells and adequate Bentonite for installation. Please contact NLP for more information. TR110-3/8" I.D. 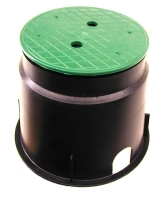 x 12" high traffic rated reinforced concrete ground inspection well with cast iron lid and ring seat.